Based on Intracoastal Bank's financial condition at the end of the first quarter, Bauer Financial Inc. announced that Intracoastal Bank was in receipt of a 5-Star "superior" rating. Intracoastal Bank Awarded Bauer 5-Star "Superior" Rating for Q1. June 16, 2012 - PRLog -- Contact: Bruce Page, President & C.E.O. Palm Coast, Florida– Bauer Financial Inc. announced that Intracoastal Bank was in receipt of a 5-Star "superior" rating based upon its financial condition as of the first quarter that ended March 31, 2012. The 5-Star rating is the highest rating designated by Bauer Financial Inc.
Bauer Financial has been reporting on and analyzing the performance of U.S. banks and credit unions since 1983. 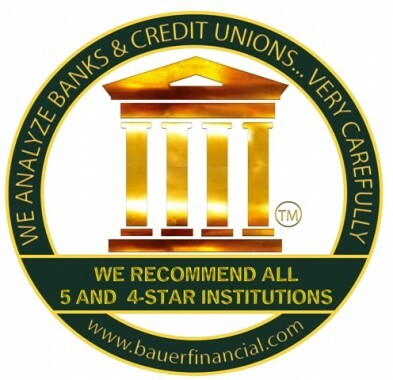 To learn more about Bauer Financial ratings methodology, go to: http://www.bauerfinancial.com. Intracoastal Bank, headquartered in Palm Coast, is Flagler County’s only locally owned and operated financial institution. Intracoastal Bank’s main banking center is located at 1290 Palm Coast Parkway, NW, Palm Coast, Florida 32137. The Bank’s Lending Center is located at 1671 N. Clyde Morris Blvd Ste 120, Daytona Beach, FL 32117. The Bank serves the Northeast and East Central Florida area. The bank offers a full range of deposit and loan products tailored to meet the needs of customers and the community. The bank is a state charted commercial bank, member FDIC. More corporate information and e-banking are available at www.intracoastalbank.net.